Prior to visiting Hong Kong I enjoyed overnight stops in Shanghai and Beijing, albeit with little or no opportunity to seek out interesting local products. Not that that should deter one from trying. A small number of modern-style brewpubs are to be found in both cities if you have the time to seek them out – for example Boxing Cat Brewery, of which there are two branches in Shanghai, and Drei Kronen 1308 Brauhaus, apparently an Asian outpost of a Bavarian brewer of the same name, although that’s not easy to confirm. There are several others. Such was also the case in Taipei, capital of that “other” China, Taiwan, a few days earlier. 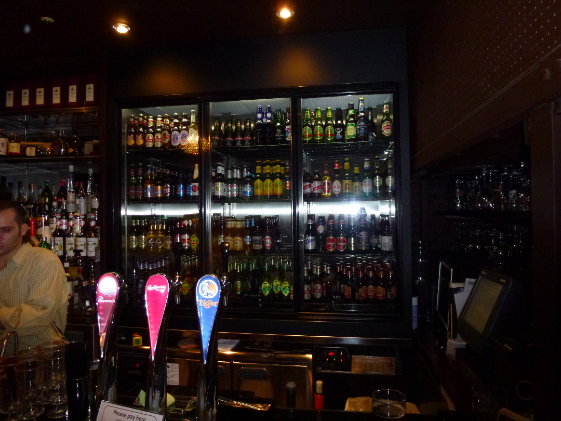 Here Le Blé d’Or and a branch of the Gordon Biersch brewpub chain are among the establishments offering a break from the near-ubiquitous Taiwan Beer. There was no chance to try these either, unfortunately, although I can report that the national brew went well with local fare. Thankfully a weekend in Tokyo did provide a few opportunities to sample Japanese brewing, however. This was true both in its established – and heavily German-influenced – form and in the shape of a new generation of micros that, somewhat surprisingly, are taking their influences from well beyond Germany or the more-recently influential US brewing scene. An afternoon out with one of my fellow UK-based colleagues, Stuart, who happened to be in town at the same time as myself led us first to the somewhat Bavarian-style Sapporo Lion Beer Hall in Ginza, Tokyo’s most exclusive shopping district and close to our hotel. The 1899 beer hall, by all accounts Japan’s first and oldest, had a bustling atmosphere and was certainly deserving of a quick visit. That said, the ¥100 (£10!) asking price per half litre limited our imbibing to a single glass of Yebisu Black beer (5.0%), a more-than-competent imitation of a German schwarzbier that epitomises the Japanese approach to brewing of the past hundred years or so. Certainly, this approach to detail – as perfected by the Japanese brewing giants Sapporo, Suntory, Kirin and Asahi – has done much to train the Japanese palate to Western-style beer, even if the country also remains deeply committed to its own native “beer”. Better known as sake. But that’s a whole other story. As is Japan’s thriving whisky industry. But there are now new kids in town. Indeed, there seems to have been something of a microbrewing boom happening in Japan in the past few years from what I observed while in Tokyo. Stu and I’s next stop was a complete accident. 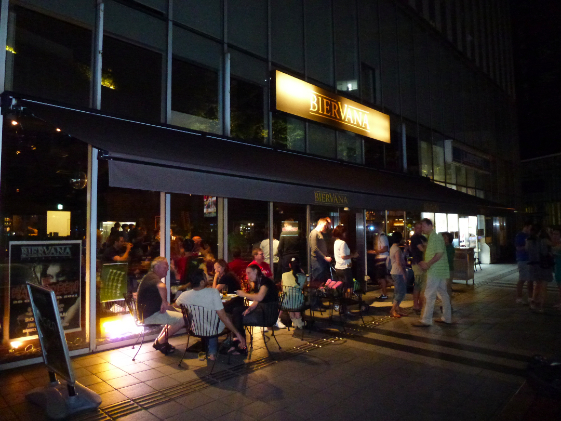 While seeking a place to watch the New Zealand-Australia Rugby (Union) World Cup semi-final in the Roppongi district often frequented by gaijin such as us (including an apparently closed branch of Britain’s Hobgoblin chain), a chance meeting with an Australian fan led us to BierVana. This understated sports-oriented bar, which was just across the boundary with Roppongi in Akasaka was, for that afternoon/evening at least, a home from home for our Antipodean cousins. But it was the draughts that I stuck with, including the house beer, BierVana, an apparently Japanese-made pale ale in a style now commonly referred to as “Pacific pale ale”. In other words, too cold, too pale with a very lemony/grapefruity hop flavour and aroma and not enough bitterness. Not perfect, but worth trying nonetheless, despite the price, although Stu wasn’t keen. That said, Stu was even less impressed by the result of the game. The Budweiser Budvar we also sampled was a much better choice, if a well-known quantity.